June Foodie Pen Pal Revel Day is here and I received my package just time. My Foodie Pen Pal Lindsey did not have an opportunity to mail out the package by the scheduled date, due to her busy schedule. The package went out this week and I just received it Thursday. So glad I got it in time to do my post. I understand things happen and people’s schedules get busy and sometimes overwhelming. No worries here, foodie box in hand = happy foodie girl. So here’s what was in my box. I am pleased that I received my package. Thank-you Lindsey for sending me some fun foodie items. I am looking forward to trying the Turkey Perky Jerky. I love me some jerky. Me and my husband make our own Venison Jerky. This jerky packs 9 grams of protein in each serving. That’s awesome, tasty and healthy. I am also a fan of spicy treats so I plan on digging into the Jalapeno Peanuts right away! Spicy…….. I am a big tea drinker so these Tazo tea bags will be perfect for my purse. This month I sent a box to Martha from MLLrungirl. She is a runner with 2 small boys and I really enjoyed reading about all the races she has done and her upcoming races. Hope you go over to her site and check her out. 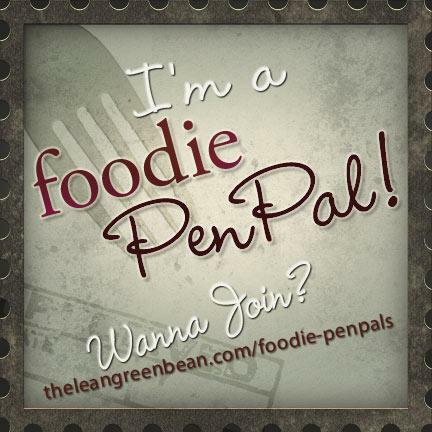 Question of the Day: What is your favorite item in your Foodie Pen Pal Box? I’d have to say I am super happy about the Perky Turkey Jerky! Last week my best friend Jody put in a request for a virtual meal. Jody lives in Miami and I was so excited she asked me to make this, because it has been a long time since I made them, and I love them. Jody has been my best friend for 13 years and I value her friendship more than words can say. She moved to Miami from Michigan a few years ago for an amazing job opportunity, I miss her everyday, but she is my forever friend and distance does not change our friendship. So after work I ran out and got some ingredients and made her request. Chicken Lettuce Wraps. This is an easy, fast recipe. Cooking time was less than 8 minutes. Made a fresh salad to go along with this light dinner. Love the crunch from the water chestnuts. Amazing how much flavor they absorb from the sauce. Also made my new favorite dessert. I just love me some Chobani Cheese Cake. Season the chicken with ½ teaspoon pepper and cook, stirring occasionally, until it begins to brown, about 3 minutes. Lower heat to medium and stir in the garlic and ginger. Add the scallions and cook for 1 minute. Stir in the water chestnuts and half the soy sauce mixture. Continue cooking until the chicken is cooked through, about 4 minutes. Remove from heat and sprinkle with the chopped nuts. Divide the lettuce leaves among plates and spoon the chicken over the top. Serve with the remaining soy sauce mixture for drizzling. Top with mung beans sprouts for garnish. Jody I hope you enjoy your virtual meal! I had fun making them. I also just found out yesterday that Jody is coming back to Michigan for the Thanksgiving holiday for a visit. Her family still lives in Michigan and when she comes to visit her family, they welcomes me into their home like I am part of the family. So I am over the moon with excitement that I get to see my Jody in 146 Days. Jeff and I went to Miami in March to visit Jody, so this is quite a treat that I get to see her twice in one year. 2012 is turning into an amazing year. Love you Jody. Now onto a Fitmixer update. So I have been doing the Fitmixer Bootcamp since May 14th. and we have just passed the 1/2 way mark. We completed a fit test on our first day and again at the 1/2 way point. I am happy to report that I was able to complete with ease several additional reps to each task. One exercise that I was really happy with seeing an increase was the Burpees. I did an additional 5 reps with ease and really felt like my form was solid the entire time, where the first time I felt like I was getting really sloppy towards the end. So in addition to the workouts, I also walk a local farm trail which is a 2 mile walk. I walk it most weekdays and it ends up being a nice 30 minute walk. Walking helps keep me stretched after a good boot camp workout. Question of the Day: What’s you favorite workout right now? I am loving my boot camp workouts. Can a nice day get any better? Yes it can. All you need is a perfect dessert. It just so happens I just have a recipe for that dessert. Wait for it…. Pineapple Chobani Cheese Cake. Yep. Perfection. Just make this easy crust and fill it. No cooking is required. You just chill in the fridge and it is ready to enjoy. Healthy, cool and refreshing. Think I will be making a few of these for a bbq I am having over the 4th of July, I think they will go over well with my friends. Summer fun foods at its finest. This little round delight made my husband one happy man after dinner. Now here is the recipe so you can make your family happy. Preparation: Add the vanilla flavored pudding mix into the yogurt and stir until well combined. Set yogurt mixture aside. In a food processor or blender, grind the bran to a fine texture. In a small mixing bowl, add the ground bran with all dry ingredients, (stevia, cinnamon, and nutmeg) and mix evenly. Then add the almond butter and water and stir until it becomes moist and sticky. If the batter is still crumbly, add additional water in 1 tsp increments until desired consistency is achieved. Pour the crust mixture into a small 4 inch circular pan. Pack the crust along the bottom and sides of the dish to create a pie shape. Pour the filling on top of the crust and smooth evenly along the top. Refrigerate for at least 20 minutes and enjoy cold. Question of the Day: What cool refreshing dish makes your family happy? When I go to Sam’s Club I always get these salmon fillets, they are stuffed with seafood and they are amazing. I have had this bag of Bob’s Red Mill Pearl Couscous since the Blend Retreat. I received this in my swag bag and was not sure how I wanted to use it until I saw the goat cheese in my fridge. I thought the creamy goat cheese would really compliment the Pearl Couscous. My favorite goats cheese brand is this Chavrie, it is soft and smooth. I also had some spinach on had and threw in a few handfuls to the dish. Never know until you try. Cooked the couscous as directed on the bag and then added my other ingredients of spinach and goat cheese, and combined and cooked for a few minutes. Here’s the couscous mix. It came out smooth and creamy just like I hoped it would, but it did need some seasoning, which I added after my first taste test. A little salt and pepper did the trick. Question of the Day: Do you ever use goat cheese when you cook? I usually eat goat cheese on toast or crackers or add to a salad, so it was fun cooking with it. Summer is upon us and I get the urge to use my oven. Sometimes I’m not sure what drives us to want certain things when it is 95 degrees outside. Well at least it was worth it, I made these lovely little pizzas. On my last trip to Trader Joe’s I picked up a tube of Organic Polenta and thought about how I wanted to use it. I love using polenta in dishes, but I usually only use it in the creamy smooth grits type texture. So the tube was a bit of a mystery to me. Pizza snacks jumped out as a fun dish, so I went for it. The tube is already pre-cooked polenta so it really just needs to be heated up and it is ready to be served. I sliced the tube into thin pieces and placed them on a baking sheet and topped with pasta sauce and shredded cheese, then sprinkled with dried parsley. This was my test run on using the polenta so I kept it simple so I could taste it and see how I can use it next time as a main meal rather than as a snack or an appetizer. Look at the little pizza. Baked on 350 degrees for 25 minutes. Really made a great snack. I guess using the stove was not such a bad idea after all. Question of the day: What new snacks or appetizers have you made or enjoyed lately?